Road trips take a toll on your patience and your body. While it’s important to keep your car in good condition, it’s just as important to keep yourself happy and healthy during long drives. Being stuck in a small space for hours at a time can damage your health. Not only can the size of your car dampen your road trip experience, but the places you stop along the way can impact the quality of your trip as well. Learning how to stay relaxed and content, as a driver or a passenger, seems difficult in these situations at best. 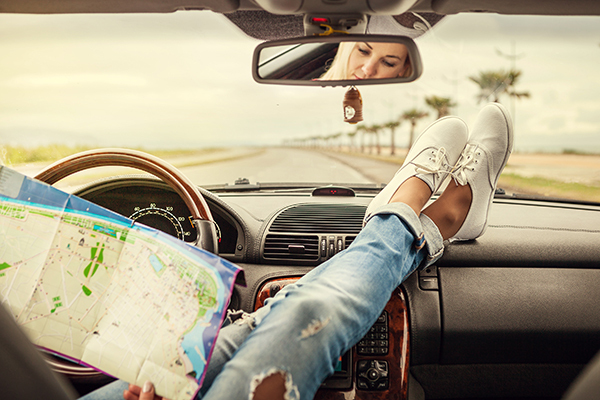 However, the experts at Drivers-Licenses.org have made a list of 10 road trip hacks that will help make traveling easier. #1 Keep your phone safe and charged – On longer road trips, phones become extremely important. From checking in with family to calling for car help, your phone is one of the most valuable items you bring on your trip. The team at Drivers-Licenses.org encourages you to make sure your phone does not get lost in the car by using a removable sticky pad to lock your phone in place on the dashboard. If you are traveling with company, buy a car charger with multiple USB adapters to keep all phones charged. #2 Bring neck pillows – Neck pillows are often overlooked on road trips, but they are perfect for catching some sleep between driving shifts or resting your head while taking pictures of scenery out the window. Regular pillows cannot be easily positioned in comparison, but they do make nice cushions. #3 Pack a cooler or a personal fridge – To limit the amount of stops you make on trips, bring some snacks and drinks with you. Coolers and personal fridges are portable ways to keep your snacks and drinks cold for the entire trip. The team at Drivers-Licenses.org suggests putting someone in charge of passing out the snacks and drinks to the other passengers to avoid distractions. #4 Personalize seats and windows – Try using seat covers with your initials or a car window shade. Whether they serve to accessorize your vehicle or shield your skin from the sun, you can be sure that your journey will be more enjoyable with some personalization. #5 Get creative with your trash – Trash is inevitable on road trips, but it does not have to be bothersome. For a cheap and simple solution to overflowing trash, the team at Drivers-Licenses.org recommends using the pockets behind the front seats, a plastic bag clipped between two seats or the center console as a temporary wastebasket. #6 Play your own music – Radio stations are unreliable on longer drives. So hook up your phone or music player to your car speakers. If your phone will not work with an adapter, there are also apps that allow you to stream your music on unused radio stations. #7 Plan your stops – Take advantage of free roadmaps and travel brochures to help plan some stops for extra sightseeing throughout your trip. Planning breaks can even prevent unsafe driving due to tiredness. Not only do certain rest stops offer free food and beverages, but you will be thankful for more breaks from the car. #8 Pack an overnight bag – If you plan on traveling longer than a day, it might be wise to bring an overnight bag with toiletries and a change of clothes. This makes overnight hotel stays more manageable. #9 Entertain the kids – Traveling with kids can be hectic, but the team at Drivers-Licenses.org recommends entertaining them by pre-packing little “surprise boxes” with treats and toys. Throughout the trip, give the kids their surprise boxes to keep them occupied. #10 Calculate gas costs – With gas prices rising, it’s important to keep track of how much gas your road trip will require. To save money on gas, you can use online gas calculators to estimate the fastest routes and cheapest gas stations.